The Teslasuit aims to become the world’s first full-body haptic virtual reality suit that lets you feel what you play. It is a revolutionary smart textile virtual reality gaming suit that allows you to interact with virtual environments providing resistance feedback. 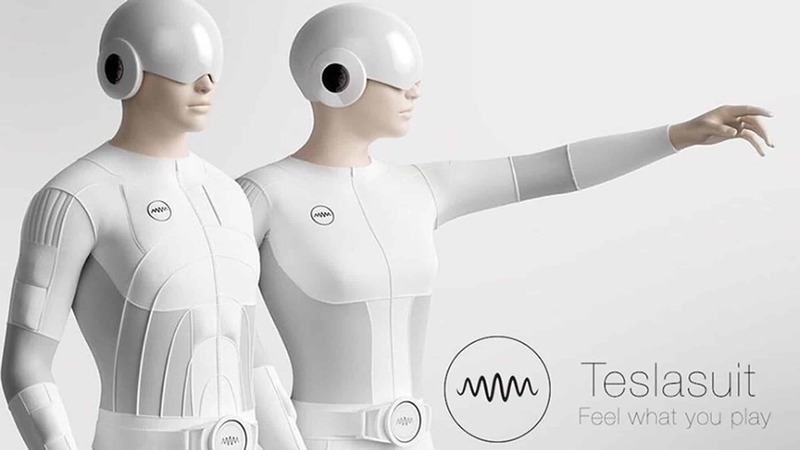 The Teslasuit electro-tactile haptic feedback system aims to give Virtual Reality users the ability to touch and feel objects inside the virtual world. How does the Teslasuit work? According to the developers of the Teslasuit and the project details which are currently on Kickstarter. The Teslasuit transmits sensations to the wearer’s body by neuromuscular electrical stimulation (NMES), which is widely-used in athletic training and rehabilitation. It is very similar to our own body “native language” and is also used in Transcutaneous Electrical Nerve Stimulation (TENS) belts and other well-known devices. Haptic feedback glove, a part of Teslasuit, is in development. Based on Neuro-muscular Electrical Stimulation that is widely used in medicine, electrotherapy and professional sport. Teslaglove incorporates a mesh of sensors that could deliver wide range of sensations such as touch, wind, water, heat, cold as well as it would allow to feel a shape of the virtual object. Based on Neuro-muscular Electrical Stimulation that is widely used in medicine, electrotherapy and professional sport. Teslasuit incorporates a mesh of sensors that could deliver wide range of sensations such as touch, wind, water, heat, cold as well as the force with tiny mild electric pulses. Tesla Suit is a wireless suit made of smart textile clothing fully integrated into a virtual reality system. The Tesla Suit performs a dual role as a motion capture system and a state of the art smart textile, incorporating thousands of nodes to directly stimulate tactile sensation and pleasure in the skin through mild electric pulses. Although the Teslasuit is not yet commercially available. They have created several prototypes of the suite, and asked people to give their feedback on the Teslasuit. Here is some of the feedback they got from VR users. Teslasuit incorporates a mesh of sensors that could deliver wide range of sensations such as touch, wind, water, heat, cold as well as the force with tiny mild electric pulses.